In 2015, VICE News followed Adam Driver and a group of fellow actors on a trip to the Middle East. The mission: offering theater to surrounding military bases through an organization called Arts in the Armed Forces. Driver, a Julliard graduate who has since starred in HBO’s critically acclaimed series “Girls” as well as such films as Star Wars: The Last Jedi, The BlackKklansman, Logan Lucky, Silence, and This is Where I Leave You among many others, began as a United States Marine with 1/1 Weapons Company. Throughout his career, Driver has talked openly about his time in the marines as well as the transition from the military to acting, from soldier to civilian, and the similarities between the two seemingly dissimilar paths. “In acting school, I was really, for the first time, discovering playwrights and characters and plays that had nothing to do with the military, but were somehow describing my military experience in a way that before, to me, was indescribable,” Driver says in a 2016 TED Talk. What Driver and Arts in the Armed Forces demonstrates is the inherent need for artistic forms to establish connection or serve as an outlet to convey emotions, whether it be through painting, theater, music, or writing. This demonstrates the inclusivity that the arts has across all genders, races, sexualities, occupations. There is no limit to who is capable of self-expression. There is no limit to how language can impact another human being. For Driver, the arts and the theater gave him a place and a way to funnel his feelings and his emotions into a constructive, creative, expressive outlet. The arts provided Driver with an expressive language which he, in turn, has encouraged through performances organized by Arts in the Armed Forces. As Driver explains, the arts and his organization offers audiences with a “new means of self-expression,” a vocabulary, and relatable, human characters to carry with them. Though Arts in the Armed Forces centers on performance art, it is important to remember the artistic language is present in all forms so long as the form allows a person an outlet to expel what is inside themselves. As writers, we express through the written word. It is our escape, our voice, our platform, and our outlet. The video below explores Arts in the Armed Forces (joined by Driver, Joanne Tucker, Natasha Lyonne, Eric Bogosian, Peter Scolari, Sasheer Zamata, and many more) experience in the Middle East delivering on-base entertainment. Driver also delivers an emotionally charged monologue from the 1976 play “Curse of the Starving Class” by Sam Shephard. This entry was posted in Uncategorized and tagged Adam Driver, arts, language, Liberal Arts, military, monologue, performance art, self-expression, theater, Writing on September 7, 2018 by carlieelizabeth24. Cabrini University hosted the fifth annual Forum for Undergraduate Student Editors (FUSE) conference at the beginning of November 2017. FUSE is a national organization that provides a network for undergraduate student editors and writers and their faculty advisers. The three-day conference brought together about 60 students from 13 universities for a series of writing and editing workshops and panels centered around the theme of representation and resistance. Poet and activist Martín Espada kicked off the conference with a captivating reading of his poems, which “explore the immigrant and working class experience.” He read passionate poems from his published works as well as moving poetry in response to today’s political climate. Espada also hosted a workshop on satirical poetry where he read examples from Marge Piercy, Ernesto Cardenal, Jack Agüeros, and John Millington Synge before encouraging students to write and present their own satirical poetry from what they learned. Carlie Sisco, Nicole Gray and I presented an hour-long workshop session titled “Using Documentary Theater to Craft Monologues of Resistance.” During the workshop, we worked with student editors from other schools to write monologues that addressed the issue of polarization in our society. We used examples from Anna Deavere Smith’s 1994 book, Twilight, Los Angeles, 1992, to help students shape their own monologues. Smith’s book contains monologues from people involved with and impacted by the 1992 Los Angeles uprising in protest of the police brutality of Rodney King. 2017 marks twenty-five years since the uprising occurred, so we really wanted the monologues created during our workshop to do justice to Smith’s work and the legacy of the event. It was a little nerve-wracking to present in front of a whole seminar room of my peers, but they were extremely receptive to our vision for the workshop. It was especially rewarding to hear how the mode of monologue-writing pushed people out of their comfort zones and made them think about language–and the impact of it–in a different way. The most inspiring aspect of this conference was being able to hear the incredible writing of my fellow peers at the open mics. We are a very tight-knit team at Widener and we’ve gotten to know each other not only as people, but also as writers. It was amazing to hear from the talented students at other universities and colleges who are brave enough to read personal or vulnerable pieces of work to a room filled with strangers that share the same passion. This conference allowed for so many opportunities to generate pieces as well as reading them. Between those who shared during Martín Espada’s workshop and those who read during the two-hour open mic, I’ve become so impressed and inspired by those around me. It’s a true testament to why we do what we do. As writers, we aim to inspire, move others, express a given voice, and potentially make a difference with the stories we tell. Listening to the students I’ve gotten to meet and work with over the course of three days, it’s easy to tell that we’re on that path. I’ve never felt such a part of such a talented community. After attending Martín Espada’s workshop and enjoying how people got very into the performance element of their writing, I felt it was a must to attend the performance poetry workshop. I was glad I did. Susquehanna University held a session titled “Using Performance Poetry to Reclaim Identity” in which students were asked to explore their identity, what brought them to this place in their lives, and what sense of self does to propel them in today’s society. The students running it had history in acting and were able to provide suggestions about voice and body language. They also shared information about a slam poetry club they were involved in at their own school. It was cool to hear that performance poetry is becoming more appreciated as literature in itself, since it certainly has qualities that cannot be expressed through pen and paper. During the FUSE conference, a few Widener students participated in the workshop shop hosted by fellow University of California Los Angeles students, titled “Finding Your Voice.” The prompt given at the workshop was to write about a time that you feel you should have spoken up when feeling marginalized or when your voice was undermined. We were given fifteen minutes to write about this moment in time and then an additional ten minutes to write about how the conversation would have gone had you spoken up. In this moment, I was forced to step into the consciousness of the individual whom I disagreed with and conceptualize realistic dialogue for this hypothetical situation. While I did not necessarily come to any resolution with that person, I found that exercise to be cathartic, daunting, and comforting. It was comforting to know that I had internally confronted the individual and myself, knowing that I will be prepared in the future for confronting ignorance and bigotry. FUSE was interesting. I liked being surrounded by writers and getting to know people from different schools who shared my majors. Martín Espada, our guest reader, had great pieces with awesome backstories and meaning. He was very animated and was entertaining to watch. I also enjoyed hearing pieces written by the other students, read during the open mic. I learned some interesting things during the different panels as well. The first talked about writing monologues, which is a style I hadn’t written in before. It’s a great way to exercise dialogue-writing skills. Another panel I went to talked about editorial policy, which I was interested in because I want to be an editor. We discussed how to choose what should and shouldn’t be accepted in a journal. Being Widener Ink’s past editor-in-chief, it was interesting to hear from other students who ran literary journals and to hear what they did differently. Overall, the conference was a great way to meet people with similar skills and goals as me, and it was a great learning opportunity. This entry was posted in Uncategorized and tagged College, Creative writing, English major, FUSE, FUSE 2017, Liberal Arts, Poetry, representation, resistance, Undergraduate literary journal, Writing on November 13, 2017 by carlieelizabeth24. Since 2012, Widener students have been attending and presenting at the Forum for Undergraduate Student Editors (FUSE) national conference. This year, students and advisors from fifteen schools from South Carolina to Pennsylvania to Michigan to California came to Bowling Green State University in Bowling Green, Ohio to present on the conference theme of literary citizenship. Widener University was represented by junior English majors Emma Irving and Jennifer Rohrbach and senior creative writing and communications double major Kelsey Styles, along with creative writing professor and faculty advisor Dr. Michael Cocchiarale. Literary citizenship is, to put it quite simply, the act of creating a more positive community with stronger writers and editors. It can also include the acts of maintaining diverse journals, teaming with other publications and organizations on campus, communicating effectively among staff and writers, and encouraging participation from all students—not just English or creative writing majors. Widener students presented a panel about how four campus publications tackle this issue. Widener’s The Blue Route, a national undergraduate literary journal, publishes interviews with local authors and poets. Widener Ink and the Blue & Gold both sit down with students and work together to improve that student’s writing. The Chester Magazine connects Widener with the surrounding community, and works to bridge Chester’s growing arts scene. All three of Widener’s student representatives collaborated to create this panel. Working with Widener’s dedicated community of writers, editors, and readers gave me the opportunity to hone my own writing and editing skills through publications such as The Blue Route, the Blue & Gold, and Widener Ink. My three years at Widener have shaped me into a literary citizen without me even realizing it! But the literary community is so much larger than what we see on Widener’s campus. Attending FUSE at the wonderful Bowling Green State University opened my eyes to the national literary community, what it has accomplished, and what it can become. We hit the ground running on Thursday, the first day of the conference. After a business meeting and a journal showcase, students from universities across the United States presented panels on how their schools and publications promote literary citizenship. I learned that literary citizenship is a much broader, yet more inclusive term that I’d originally thought. Anyone with a love for literature and a desire to share it can be a literary citizen. One of the most inspiring panels I attended was about representation and diversity not only in the stories published in journals and lit magazines, but also among the editors reading submissions. On Friday, the group split up for roundtables where students from different schools could more casually discuss topics such as aesthetics and technology and advising student editors. It was a great experience to speak with students I otherwise would never have met, and it was reassuring to hear that they go through the same highs and lows with their publications that I go through with the publications I’m a part of. After the roundtables, I chose to participate in the Guerilla Poetry activity—just one of the various activities for the afternoon. A group of about 10 students and I left sheets of poetry all around Bowling Green’s campus which, for comparison’s sake, is at least three time’s Widener’s size, if not more. We got some weird looks from Bowling Green students as we stuck poetry in random books at the library and in between bike wheel spokes. But not an hour later our ‘tour guide’ Ally Butler (a student at Bowling Green and FUSE attendee) got a Snapchat from a friend who was delighted to have found a poem stuck to a tree in the middle of the quad. While the conference itself was great, my favorite part was the new friends I made. On a campus as small as Widener’s you can see the same people every day. It was inspiring to realize that there is a community of writers and editors out there in the world who are as enthusiastic about literature as I am, and who are dedicated to instilling that enthusiasm within others to further cultivate literary citizenship. I attended many panels about literary citizenship. The first panel I attended was run by two students from Francis Marion University in South Carolina. They talked about how to get more majors involved with the literary journals on campus. Editor-in- chief of their journal, Snow Island Review, Anna Jackson, was herself a psychology major, and used that to her advantage. During her presentation, she pulled up scientific theories of motivation, such as Maslow’s hierarchy of needs, and explained how she incorporated them into her campus organization. She explained that by giving editors more responsibility and making them feel like they were contributing to something important, they became more excited to work toward the common goal. Not only did meeting attendance increase for them, their submissions soared from about 75 to about 180. The next presentation I saw was about Susquehanna University’s literary journal, Flagship. It’s a journal just for travel writing, and it’s open to all majors at their university. At Susquehanna, it’s required that all students study abroad at least once. This journal is not only a collection of some of those stories, it’s a way for students to cope with any culture shock or large experiences they were struggling with since returning from another country. The final panel I attended before my own presentation was about representation in literature, entitled “Maintaining a Diverse Literary Community.” Camera Martin from Oakland University explained how it was the responsibility of editors to include diverse writers. Editors are the gatekeepers of media, in many cases. By opening the door to writers of color and writers of different sexualities, editors are able to create a more diverse and empathetic audience—and it is their job to do so. Her panel was fabulous. Widener followed her which was both tough because it was such a strong presentation but also a plus because she’d drawn a significant crowd. We basically had a full room to discuss how Widener contributes to literary citizenship—which we do in many ways. There were more than just panels. I also went to a keynote speech by the very talented Karen Craigo (I know she’s very talented because I attended her reading later that day). I went to a reading by Wendell Mayo, a fascinating author with strong voice. Friday, I attended a discussion about how other schools conducted their literary journals. Widener’s literary journals are extracurricular, though the Chester Magazine had a class element to it and Professor Cocchiarale has taught a Contemporary Literary Scene class that examined current undergraduate journals including our own. All schools who participated in the discussion explained some of the benefits and the drawbacks of conducting their journals in the class format. Some schools, like Susquehanna and Widener, had several journals, and some schools, like Cabrini, only had one. Bowling Green also hosted workshops where students could either work on their writing, post poems around campus, or create their own zines. Though I had initially been wary about the small size of the conference, FUSE 2016 was ultimately just as amazing as a large conference. I was able to make closer friendships than I would have otherwise made. It’s easier to get to know someone when you’re constantly in close proximity. At a larger conference, I might not have seen the same people twice. This FUSE, I not only saw people constantly, but by the end of the conference we had interacted so much that I could consider us friends. If you wish to start a FUSE chapter at your undergraduate institution, check out the FUSE National website for more information: http://www.fuse-national.com/. This entry was posted in Uncategorized and tagged College, Creative writing, English major, FUSE, FUSE 2016, Liberal Arts, literary citizenship, Undergraduate literary journal on November 28, 2016 by carlieelizabeth24. Author Patricia Engel visited Widener’s Main Campus Oct. 18 and 19 as a part of the English and creative writing department’s Distinguished Writers Series. The visit, scheduled after the recent publication of her novel and New York Times Editors’ Choice, “The Veins of the Ocean,” gave students the opportunity to question Engel about her writing process. Prior to “The Veins of the Ocean,” Engel published two other novels with Grove Press, including “Vida” in 2010 and “It’s Not Love, It’s Just Paris” in 2013. She also has work appearing in the New York Times, The Atlantic, A Public Space, Boston Review and Harvard Review, among other publications. Engel has already started thinking about her next novel focusing on a much broader and bigger family saga, though it is still considered to be in the very early stages. It will include similar themes to her previous novels, highlighting an interest in family and immigration. During her Widener visit, Engel individually met with several students for tutorials and visited creative writing and English classes on campus. “Having someone from a totally different background come in and look at my story offers new perspective I wouldn’t otherwise have,” said Kelsey Styles, a senior communication studies and creative writing major who met one-on-one with Engel. This entry was posted in Uncategorized and tagged Creative Writing major, English major, Liberal Arts, Patricia Engel, Writing, Writing Advice on November 11, 2016 by carlieelizabeth24. Confession: Last summer, I made Faulkner my own summer reading. Or at least I tried…it was a struggle. The problem wasn’t that I didn’t enjoy the complex characters and sinuous narrative of Absalom, Absalom! because I absolutely did. The problem was that it was summer. From the time we enter high school and start receiving summer reading lists, we’re expected to be the same scholars in the summer that we are during the school year. It’s an institution that makes sense for high school students, especially those in AP classes where there’s already too much material to get through in the year before the exam, but in college, the situation is quite a bit different. Instead of taking 5 AP tests all in different subjects, as an undergraduate, your major is your absolute focus, the area your brain spends in thought for a whole year. When you’ve spent your semester reading Wallace Stevens, James Joyce, and William Shakespeare all at the same time, when you reach for intense scholarship in your field during the semester, it’s okay to allow yourself to be a different kind of scholar in the summer. There are so many other ways to be just as interesting a scholar without forcing yourself through a novel just because you think it’s something you should be reading. 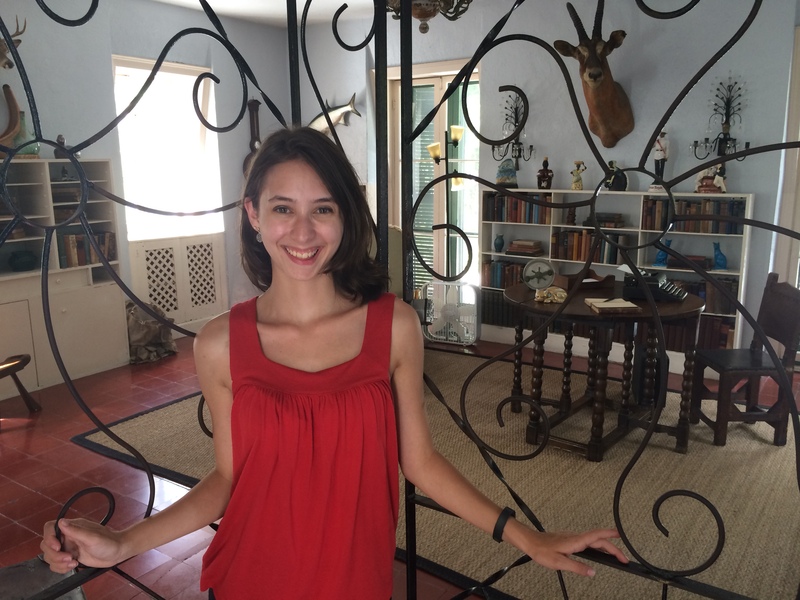 The author at the Hemingway House in Key West, FL, during Summer 2014. Instead, read something for fun! Reread a childhood favorite, open Fifty Shades of Grey sans embarrassment, or relax poolside and flip through gossip magazines. Or, travel somewhere of historical/literary/personal significance and watch throughout the year how much that experience comes back to deepen your understanding of a particular subject. Write in a diary, stay up late and talk about existential issues with your friends, sit and people-watch for an afternoon; though it may not seem so, doing these things makes for a scholar with an interesting and broad perspective of humanity. So if you’re someone who wants to read Faulkner for fun this summer, by all means, have at it. But for those looking for a way to take a break and be a different sort of scholar for a few months, now is your time. This entry was posted in Uncategorized and tagged College, Humanities, Liberal Arts, Summer on May 26, 2015 by erirving. English vs. Creative Writing: Which Major is For You? The question to really ask, more than what major to pursue, is what you want to get out of it, or do with it, in the long run. What skills are you looking to learn? What kind of reading gets you going? If what you loved about your high school English classes was the opportunity to read the classics, then English is probably more your pace. The English major is designed to look critically at “Literature with a capital L,” as one of my professors describes it. Your classes will involve close reading, craft analysis, and a lot of critical thinking about works written by men who are probably long-dead. But what about after college? In the professional world, Milton and Shakespeare might not seem particularly applicable, but the skills you learn from studying them will be. Aside from the more obvious benefits of being able to compose a coherent email, you will be able to effectively communicate thoughts and connect with people. If you find yourself more interested in constructing your own work, your home is probably in the Creative Writing department. Your classes will involve reading more recent work within a genre. Milton and Shakespeare are all well and good, and you’ll certainly take your fair share of Lit courses, but they won’t be enough to make you shine in today’s tough market if you’re actually trying to make it as a writer. What classical writers have “always done” and what defines Literature isn’t always what people are doing today. Professionally speaking, your options will be more specific, and from some perspectives, limited. If you’re looking to write for a living, or are interested in the publishing business, then Creative Writing will look just as good on a résumé as English, but employers outside of the field might respect it less. How does being able to construct a solid narrative or stick to a rhyme scheme make you the right person for the job? This major will teach you critical thinking as well, but it will nurture your creative side even more, and urge you to explore new styles. No matter which major you choose, it’s hardly an either-or decision. If you choose Creative Writing, most schools will require several English classes; in an English major, you can use your electives to explore Creative Writing and its possibilities. This entry was posted in Uncategorized and tagged College, Creative Writing major, English major, Liberal Arts on October 14, 2014 by Sierra Offutt.